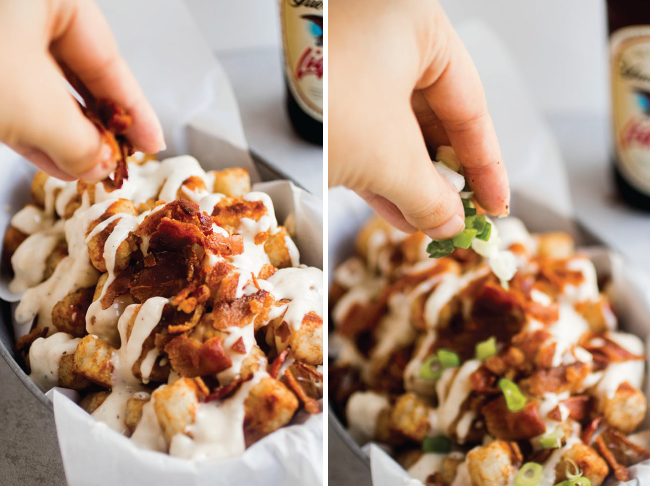 These loaded tater tots feature crispy bacon, fresh green onions, and a velvety smoked gouda cheese sauce! 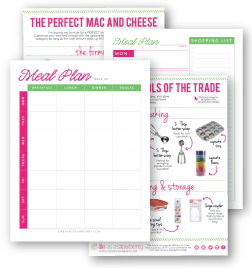 Perfect for entertaining and simple to make. Side note: There is no other food with a name MORE satisfying to yell at the top of your lungs. 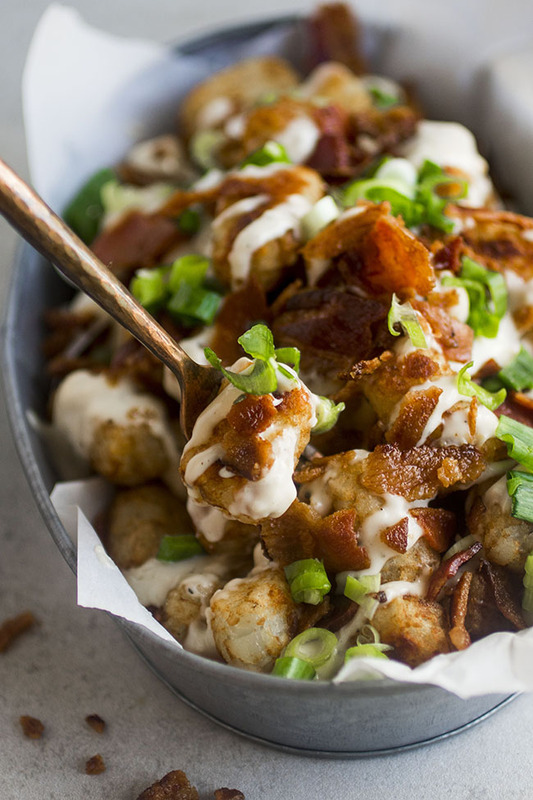 And, umm, THESE tots? I’m pretty sure they’re everything your life has been missing. They have GREEN ONIONS (which, ok, maybe slightly less exciting than the bacon). They have a SMOKED GOUDA SAUCE which I may or may not have spent ten minutes just eating with a spoon before I got my life together enough to actually assemble these things and take a picture or five for you. (My job is really hard sometimes, you guys). Now, usually, I’m a pretty strict proponent of making everything from scratch. But today (FULL DISCLOSURE because we’re internet BFFs and internet BFFs don’t lie to each other, OKAY? Okay). TODAY, I wayyyy super-duper cheated and bought *GASP* store-bought frozen tater tots. But whatever, you guys. Sometimes you just gotta do what you gotta do. And sometimes what you gotta do is buy processed tater tots and then BE OKAY WITH IT because the world does not end if we all buy some pre-made food once in a blue moon. 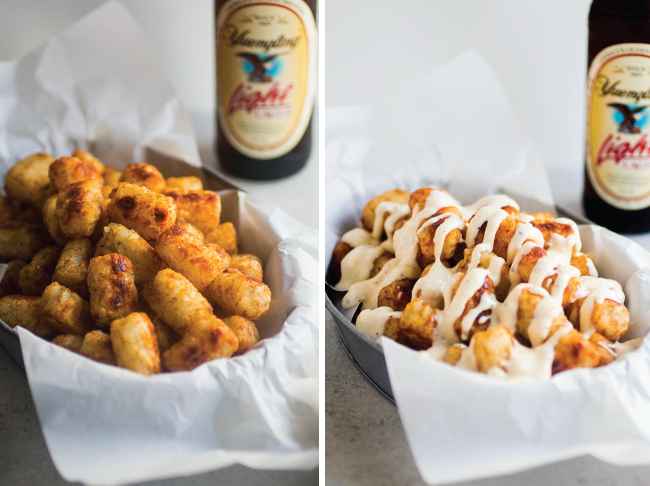 And then you can be double okay with it because you’re about to drown these tots in the most fantastically lusciously smokey (HOMEMADE! Ten points to Gryffindor) smoked gouda sauce and then you’re going to cover them in some bacon and some green onion (VEGETABLES!) and everything will be right in the world. 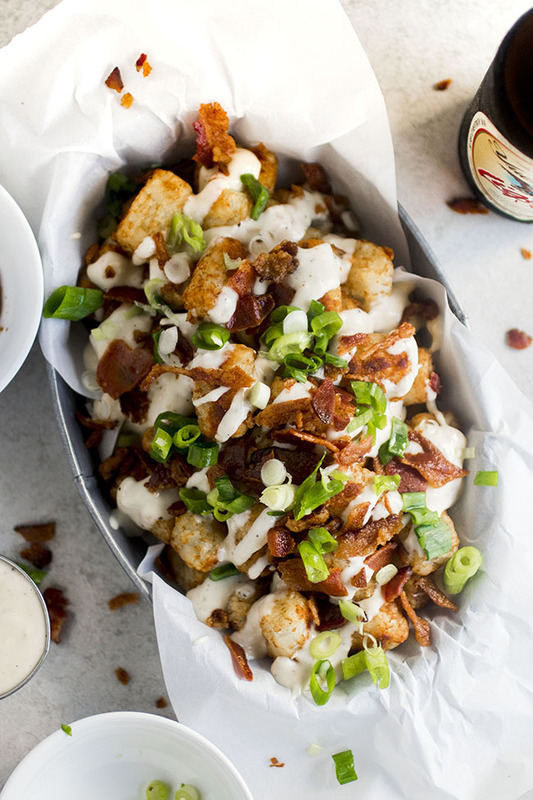 But also, if you’re ambitious and make your own tater tots for this recipe, 1. you’re my hero and 2. please call me IMMEDIATELY because I will come help you eat them allllll. 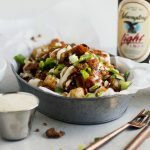 Delicious loaded tater tots with a smoked gouda cheese sauce. When butter is melted, whisk in flour to form a roux. Cook for 30 seconds or so to cook out the raw flour taste. Slowly add milk to roux, whisking constantly to work out any lumps. Whisk dijon mustard into sauce. When sauce has thickened, turn off the heat and stir in shredded smoked gouda cheese. Stir until cheese has melted, then season with salt and pepper to taste. Set sauce aside. Cook bacon until crispy (I like to roast my bacon, but you could also cook it on the stovetop). 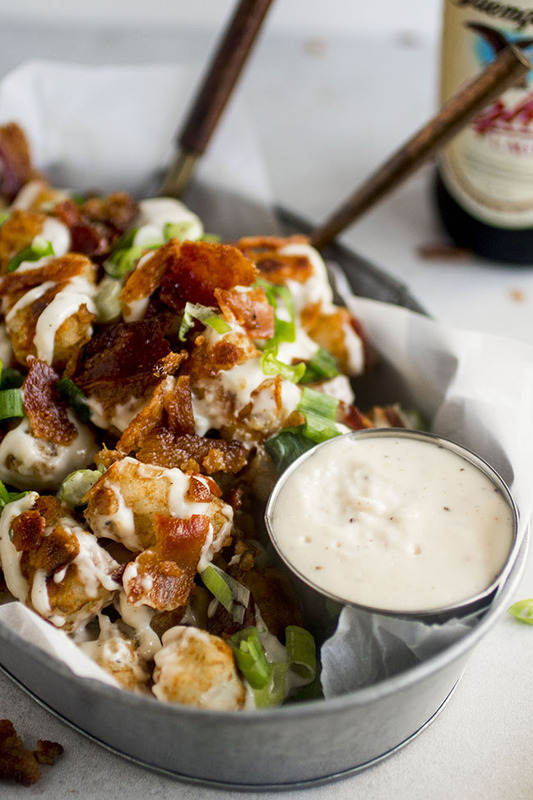 Let bacon strips cool for a few minutes, then crumble them into bite-sized pieces. Set aside. 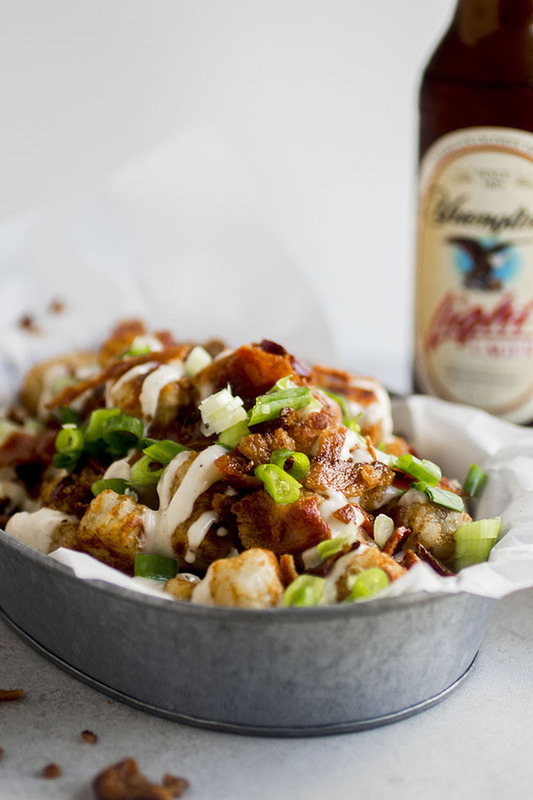 Cook tater tots according to package or recipe directions until they’re VERY crispy. 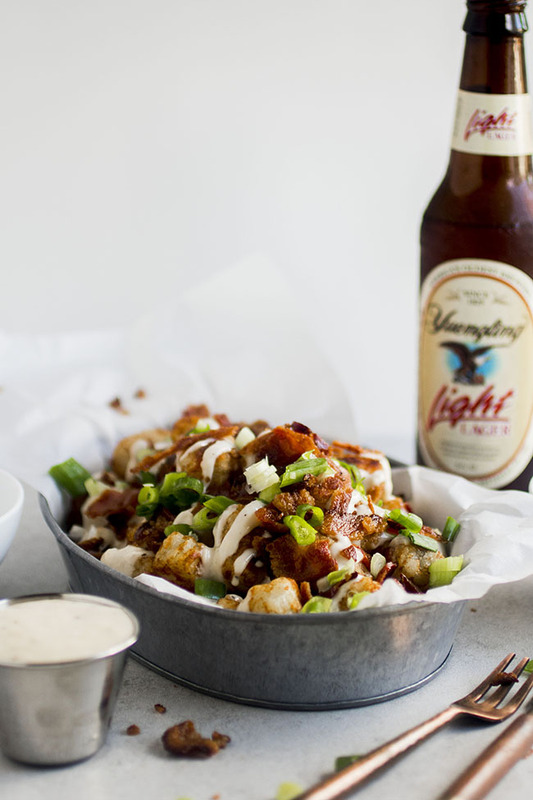 Transfer crispy tater tots to a serving dish and drizzle about 1/2 of the cheese sauce over the top. Reserve the remaining cheese sauce to serve on the side of the tots! 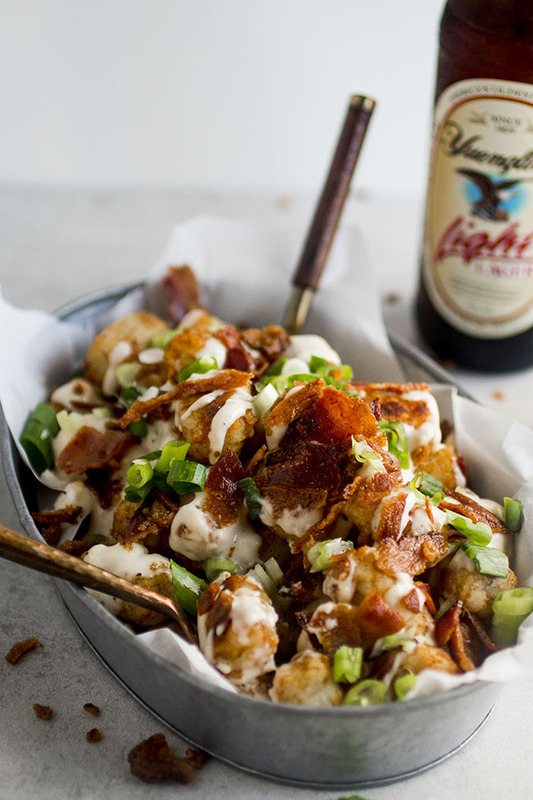 Top cheesy tots with bacon pieces and chopped green onion. Season with another pinch of salt and pepper if desired and serve immediately. If your cheese sauce isn’t as smooth as you’d like, zap it with an immersion blender for a few seconds to bring it back to a creamy consistency! Having this for dinner on this St. Patrick’s, my version of Irish food, haha! But wow…the smoked gouda cheese sauce is EVERYTHING! In love. Thank you Jessie! Wahoo! That cheese sauce is my FAVE. I’m so glad you liked it! DROOL. DROOL EVERYWHERE. So first, I want to bathe in this Gouda sauce. Looks totally amazing. And second, that bacon. Yes. I must have these soon! Thanks so much, Karly! 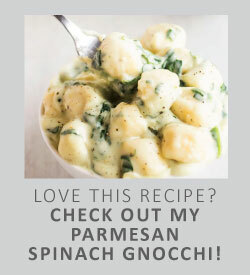 I am soooo with you on that Gouda sauce – it’s a new fave for sure!